There was a real Summer Holiday feeling in town yesterday. All we needed was Cliff Richard, Una Stubbs and a red double decker bus to complete the happy scene. Okay, so if you are under a Certain Age, you won’t understand the reference so just take my word for it. That red double decker bus was a symbol of Holiday Freedom in 1963. My dear Grandad enjoyed the film so much, he went to see it twice each time a solitary elderly fella in a cinema full of teenagers. I think yesterday it was the fact that children were out in force, celebrating the end of the school term and the feeling of summer stretching out before them. I do remember that feeling; the first days of School’s Out when the summer holiday ahead seemed endless. Obviously I am wearing rose-coloured specs because, in my memory, the sun shone every single day. Rather like here and now in Summer 2018. Once upon quite a long time ago, on holiday with Mr B - I think we may have been in beautiful Rhodes, or equally beautiful Paphos - the first week of our fortnight’s holiday was very civilised. The swimming pool was mostly empty, apart from me doing my stately twenty lengths three times a day, and there were no queues at the buffet tables, morning, noon and night. Then in the second week everything changed with the advent of the school holidays and families out to make the very most of their time out. Suddenly the pool was full of beach balls, floating lilos and, of course, children happily i.e. noisily enjoying themselves. Yummy mummies were sunning themselves on the sun-beds and Dads were showing off, jumping into the deep end and making as much of a splash as they could. It was much more fun, I thought, though Mr B didn’t agree on account of always finding himself at the back of the queue for ice-cream. There was, it is true, no way I could manage even a single length of the pool without getting tangled up in a frenzied game of water volley-ball - but the hotel cleverly boasted a second pool which was for adults only. It was several degrees colder than the main pool and the other swimmers using it obviously expected me to swim rather faster than I was able - but, hey, I was on holiday so I continued to swim in my customary stately - in other words, slow - fashion. It wasn’t only in the town centre that the Summer Holiday feeling prevailed yesterday. 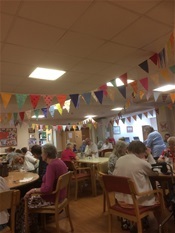 At the Guild Care centre where Mr B went for his weekly pamper session, the main hall was festooned with brightly coloured bunting. I do so love a Bit of Bunting. There are few things more, well, festive, don’t you agree? Thanks to my friend Sue, who runs sewing classes for novice seamstresses like me, I can run up a pretty awesome string of bunting, though I say so myself as shouldn’t. When granddaughter Eleanor came to stay a couple of years back, our Holiday Project was making bunting for the Twinkles’ bedroom. We nearly came a cropper when something went wrong with the sewing machine but amazingly Eleanor managed to drag from her memory lessons in Home Economics which enabled her to get my sewing machine back on the road. So to speak. Today, too, our Nomination Whist Group broke up for the Summer Holiday. Everyone arrived on our door-step hot and panting from the warm weather so my glasses of iced water went down a treat. Then at “half time”, instead of handing out details of the date of our first meeting after the summer break, I brought in a cake (yes, it was my usual cake, courtesy of the Divine Delia, how did you guess?) decorated with the words “We’ll meet again - Sept 5”. I have to admit that cutting out the letters in pink icing was stickily difficult - this summer weather has a lot to answer for. I had also not added up in advance exactly how many letters there were in my message - I only just about managed to fit them all round the circumference of the cake and even so I had to shorten September to Sept. Still I think everyone understood; they all took their diaries out of their pockets and took down the date immediately. Lest they forgot. I do love that Summer Holiday feeling. You don’t actually need to travel anywhere or spend lots of money on all-inclusive hotels. It’s all about the feeling, don’t you know? School’s out for summer.